A couple of weeks ago Gigi took a day off and we had a girls’ day. We started the day by meeting up at IKEA. We shopped and had lunch and shopped some more. By the time we made it to the warehouse, so close to the registers and the car, our knees had had it. So we picked a sofa, sat down and planned our next move. Luckily I pack my ActivOn. We applied liberally, I to my knees and Gigi for some reason to her forehead. Does she not remember the last time we made that mistake? Eventually we made our way to the registers. Gigi paid for her purchases (I was good and didn’t buy A THING. MIRACLE!) Then we piled into Q-Tip (CSP’s truck) and headed North. We had decided to see a movie but had a little time to kill. 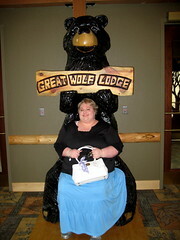 So I thought I’d do a drive by at the new Great Wolf Lodge. I had yet to see any signs announcing the grand opening, but the other day while out and about CSP & I saw this giant funnel thing that must be a water slide and I knew Gigi would get a kick out of it. I turned onto this little side road to approach from the back. We could see construction vehicles, but since we were in Q-Tip (the big white truck) we thought we’d blend in. As we approached Gigi came up with a story just in case we were stopped: My husband is a construction worker there and I was bringing him a sandwich. Riiiight. Nevermind we didn’t have a sandwich on us and if they made us pick my husband out of a line up of constructions workers we’d be toast! 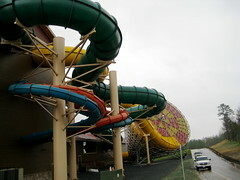 As we drove around the back of the building to look at the water slides we noticed people inside the water park area. Training they must be. We pulled around to the front of the building and there were lots of cars in the parking lot. And butler types standing by the front door! So I pulled up under the overhang and rolled down the window. Turns out they had opened early! They just weren’t advertising it yet. The little butler man gave us a pamphlet and told us we could go in and have a look around. Fun! It’s so cool in there! 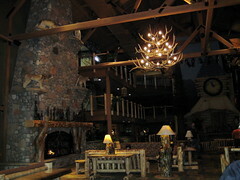 The lobby is huge and all wood cabinish. 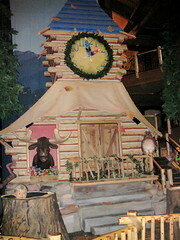 They have this clock tower thing where they must have shows because there’s a creepy fake kid squatting in a barrel. 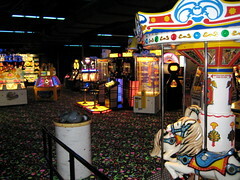 We went downstairs and checked out the arcade. 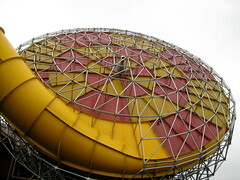 They also have a kids’ spa & an adult spa, plus lots of snack places & a big gift shop. Just remembered we didn’t go in the gift shop! Dag! We made to go into the water park but they wouldn’t let us go in without paying for a room. We were fully dressed with no swimsuits but I guess they wouldn’t put water slide crashing fully clothed past us. So I had to settle for taking pics through a window. There were only like 5 people there. I tell you, if I were rich I’d have booked a room right then just to go into the non-crowded water park. So cool! They keep it at 84* and it’s indoor. That is heaven for a white girl like me. No sunburn! No overheating! No skin cancer! No wristband, no entry! 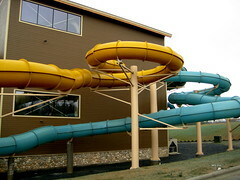 So we headed back out to the truck and drove back around the back of the building so I could get pics of the water slides. So cool how they go in and out of the building! They also have a little outdoor area. 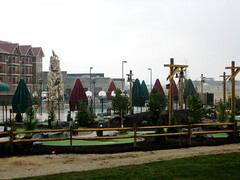 Looks like a mini golf thing and maybe a water feature. It was all misty, cloudy & rainy so the pics aren’t all that bright. It was time to head over to the mall for our movie. We saw He’s Just Not That Into You. There were a couple of cute parts, but mostly it was just long and I kinda wish I’d spent that time napping. We talked to Momo after the movie and found out she was on her way home from school. Gigi & I went to Starbucks for some fun beverages then met up with Momo at Charanda for dinner. Momo’s boyfriend Oscar is a waiter there so it’s like dining with a celebrity. All the other waiters came over to say hello. And Oscar waited on us so we got to hug and kiss on him. He smells so good and is very polite and super sweet. Dreamy! Plus, freebies! Ole! After dinner we went back to Papa & Gigi’s and watched movies and picked out a new liner for the pool. I’m so excited- they are thinking of turning the pool into a salt water pool! Woot! Good for my excema! Finally it was time for me to head home. It was a long, but fun girlie day! 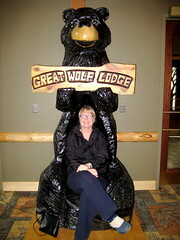 We spent seven days at the GWL near Williamsburg, VA last summer. Get there as fast as you can!!! That tornado shaped thing you can see from the outside is called, well, The Tornado. I won’t spoil the “surprise,” but will just say to BE PREPARED (and a little afraid). BEST PLACE EVER! !